Description: creates unforgettable volume and curl. Eylure Naturalites strip lashes enhance the natural beauty of your eyes. Suitable for all eye shapes, they are ideal for regular wear or a speci.. 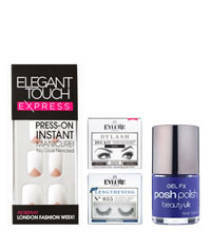 Description: Classic even styles, full lashes and with a lovely vintage look. Eylure Naturalites Lengthening #101 strip lashes enhance the natural beauty of your eyes. Suitable for all eyeshapes,.. Description: Aluminum. Textured Grip. Dual Ended. .. Description: Coarse surface removes calluses. Fine surface smoothes rough skin .. DESCRIPTION : Sharpens to a perfect point every time Cover captures shavings while blade cleaner ensures a perfect trim every time .. DESCRIPTION : Long lasting 3 shaping razors. Shape and remove hair with easy. Easy-to-grip long handle for precision and control. Blade cover for protection between use. .. Description: Trim Blunt Tip Tweezers with textured Grip ..